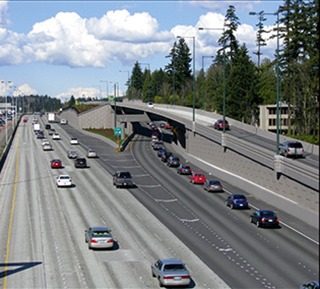 Guy F. Atkinson Construction was the construction grand award winner for the Bellevue Braids project, involving improvements to Interstate 405. Atkinson won in the highway and transportation category. Associated General Contractors of Washington recognized some of the state’s most successful projects during the 2013 AGC Build Washington Awards, emceed by KIRO radio’s Dave Ross at the Seattle Sheraton on May 22. “I congratulate all the award winners for their outstanding projects and safety efforts,” said AGC President Butch Brooks of Brooks Construction Management. The grand award winner in construction was Guy F. Atkinson Construction for the Bellevue Braids project, and the grand award winner for safety was PCL Construction Services. Tri-Ply Construction won the AGC-Moss Adams Service to the Community Award. Al Gonzales of Atkinson was named project manager of the year, Dwayne Goddard of Turner was named superintendent of the year, and Mike Fallon of PCL received the inaugural Brian Salsgiver Safety Professional of the Year award. Judges for the safety awards were Adam Gerson of OSHA Region 10, John Burdick of the Port of Seattle, Sathy Ragendran of Central Washington University, and Bill Yahn of Wells Fargo Insurance Services. Construction award judges were Ben Minnick of the Seattle Daily Journal of Commerce, John Schaufelberger of the University of Washington, Terry Brown of Zervas Group Architects, Brian Ziegler of Pierce County Public Works and Utilities, Joseph Gildner of Sound Transit, and architect Mark Estvold. Moss Adams LLP sponsors the AGC Build Washington Awards program.